Yikes! If you thought the size of EVGA's monstrous SR2 motherboard was bordering on the insane, then take a look at what Gigabyte potentially has in the works. Not only will Gigabyte's new behemoth seemingly require a colossal case window in order to show it off, but it also appears to need a ridiculously-sized box. 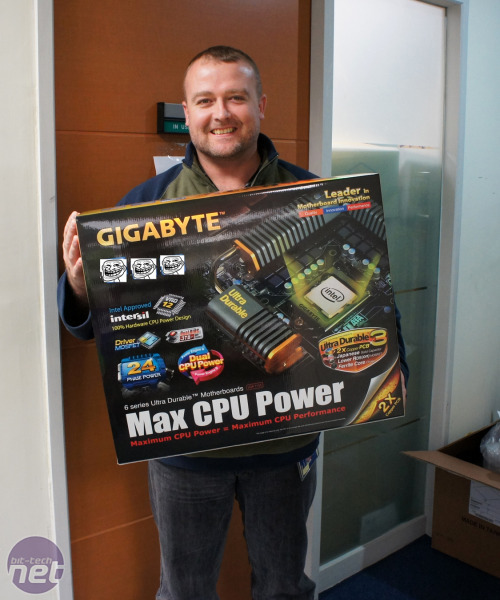 Here you can see it being modelled by Gigabyte's deputy director of motherboard marketing, Tim Handley. This is a picture of the retail package. Yes, we're talking about the actual size here. The word in Gigabyte's office is that this big boy's whopping PCB has been given the internal moniker of 'OMG-ATX' to describe its dimensions. However, its form factor will probably be given a more sensible name when it's finally released. The motherboard itself hasn't been given an official name yet either, and we had to blur out some of the logos to comply with an NDA. However, we heard a few murmurs in the office about a 'UD11' that could put the company's all-singing-all-dancing (£400) UD9 motherboard to shame. There's no word on the official specs yet either, although we've heard rumblings about on-board SSDs striped together in RAID 0 configuration, as well as an army of solid state capacitors. Heck, given the size of the box, maybe it will even feature flux capacitors. On another note, Gigabyte also showed us some of its new G1-Killer range (yes, there's more than one!) of motherboards while we were at its office. We'll have more information on these at a later date. Want a monstrous UD11? Let us know your thoughts in the forums.